So it turns out I went on a sanding frenzy and ended up with a ton of wood that I need to stain, of course that was all part of the master plan :) I have a dozen projects I have to get a move on. But First Stain! not quite as good as But First Coffee, but hey it makes me almost as happy! 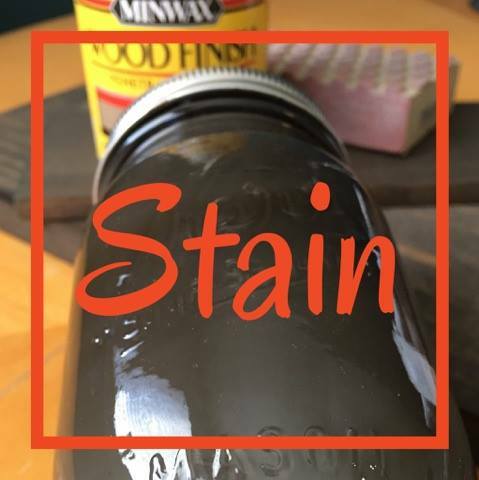 The are a bunch of different types of stain you can use for wood, there are different brands and even homemade recipes that I'v tried but to be honest I have my fall back favorite Minwax Wood Finish, an oil based interior stain. I don't always play by the rules so today I'll share with you a few tips. I mix my stains...shhhh don't tell anyone! I use 3/4 Dark Walnut and 1/4 Classic Grey. The stain has way of settling especially the grey, I find it best to mix the stains in a Mason Jar this way I can shake the jar until all the stain is mixed. It takes a while to mix - so shake shake shake! I also like it best if I can work and then throw away most of the mess, I find it best to buy cheap paint brushes and I little cool gadget I found once "paint pads" it's supposed to be used with regular paint but it works wonders with stain too. I use these thick paper towels that my husband uses in the garage they hold up really well and I can just toss them when I'm done. After you have everything you need you should be pretty much ready to go, but first lay down a old towel, or newspaper to lay everything out on and protect your table or floor that you might be working on. Next my tip on applying stain is to apply a thick coat of stain, let it sit for a minute or two then take your towel or old rag and pull off any extra stain. Above is a picture of a good coat of stain, below I've pulled off the extra stain with my shop towel. You can see how the wood grain pops! This is my favorite part of this whole process, you take a piece of wood that has been cast off as trash or no good and after sanding it down and staining it, you get this beautiful grain. Now let it dry for a couple of hours, flip it over and stain the other side and let completely dry for about 24 hours.